There was the downstairs bar of Rams Head Tavern with the top bar in progress, a little bistro where Tsunami is now, and a restaurant where El Toro Bravo currently dwells. That was it for West Street in 1995. 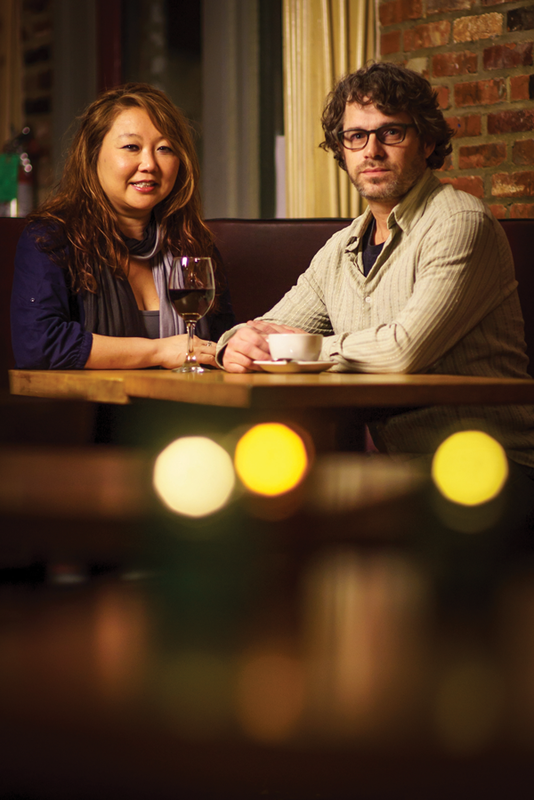 Brian and Sarah Jun-Cahalan remember how the street lacked appreciation and deserved attention. As far as cafés, there was only one in Annapolis, and it required a minimum $10 purchase. There wasn’t anywhere that the community could go to simply study or relax, have some coffee or a glass of wine, and experience a free exchange of ideas. 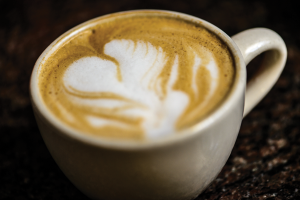 So on December 27 of that year, they opened 49 West Coffeehouse and Wine Bar, introducing Annapolitans to a café scene unlike any other. “It was just us, that’s it. We really had to fight downtown and say, ‘People, come up here; you don’t have to be downtown,’” says Sarah. The fight wasn’t easy in the beginning. They wanted to be able to serve alcohol until 2 a.m., but at the time, a coffeehouse wanting to serve alcohol as late as the bars was unheard of. “They had no concept,” Sarah says. “It wasn’t available here in Annapolis.” The process would take at least eight months, was pricey in legal fees, and the outcome wasn’t in their favor; regardless, Brian and Sarah combed through historic Annapolis by foot, obtaining signatures for their petition fighting the current ordinance. It worked, and they were granted the first 2 a.m. liquor license in fifteen years. For the first five or so years, Brian and Sarah would work up to 100 hours every week. They would keep their toothbrushes stuck in the nooks of the bar and shampoo in the dish room, just in case they were too exhausted to make the three-block walk to their home on King George Street. 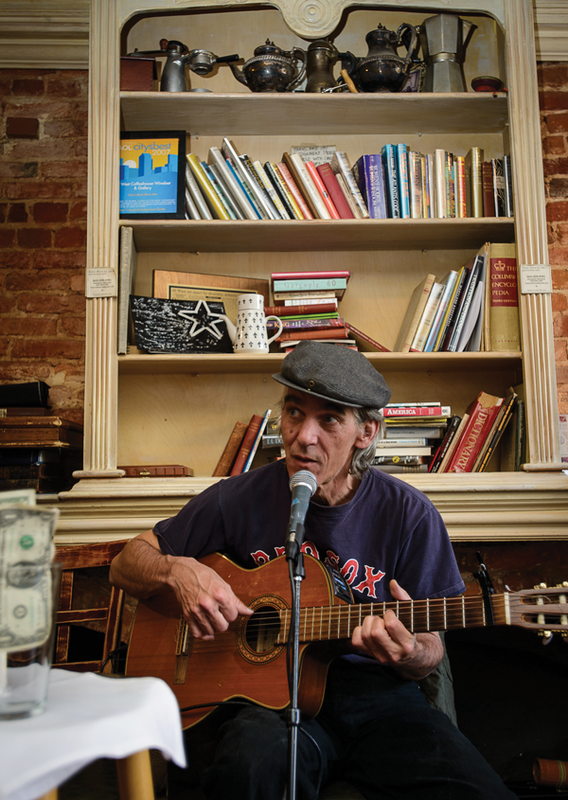 He and Sarah believe Annapolis lacked it then, but feel society still longs for community. Brian mentions the problems with televisions, cell phones, and automatic garage door openers. “You used to at least have to say ‘hi’ to your neighbor if he was trimming the hedge and you had to pull up the garage door.” It was simple. They wanted people to converse and educate each other. At 49 West, you’ll find just that. 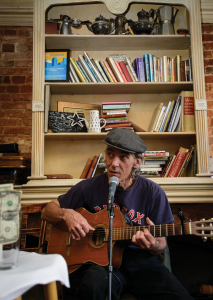 It’s a combination of art and the smooth jazz wafting into the dining room from the back room that’s unattainable anywhere else in Annapolis. It’s the fact that, no matter what day of the week or time of day, there will be art on the walls. They have made a tradition of changing the art and featuring different artists monthly. It’s been done for nineteen years, and they haven’t missed a month yet. It comes as no surprise that 49 West’s specialty is jazz. On Tuesdays, Wednesdays, and Thursdays, they host jazz nights. Sunday is an all-day affair. Music can be heard from brunch until the end of dinner, from 10 a.m. until 10 p.m. If there’s ever a chance to showcase another type of music, they don’t hesitate to book it. Sarah mentions they recently had a reggae band in the back room By stepping comfortably outside the box, Brian and Sarah constantly introduce new people to their café while also exposing their regulars to something that they may not have otherwise experienced. All restaurants appreciate their regulars, but for Brian and Sarah, they are who create the “49 West vibe.” “If it wasn’t for our regulars and everyone supporting us all of the time, we wouldn’t be here,” says Sarah. “That’s my favorite, just seeing the people that we know every day. It’s like entertaining at your home all of the time.” This is what they yearned for in 1995, to create a living room for the Annapolis community like they enjoyed in Chicago. 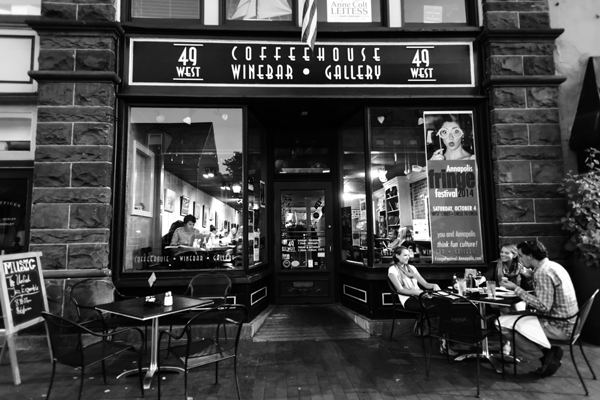 Nineteen years later, there are more than three attractions on West Street, and there is more than one café throughout Annapolis, but 49 West is unlike any other. Error: Error validating access token: Session has expired on Saturday, 09-Mar-19 15:57:50 PST. The current time is Friday, 19-Apr-19 11:19:09 PDT.